Food Costs > How Much Does Asparagus Cost? How Much Does Asparagus Cost? When it comes to asparagus, only the young shoots are commonly consumed. Once the buds start to open, the shoots will start to taste woody if not used immediately. Asparagus, a spring vegetable and flowering perennial, is native to most of Europe, northern Africa, and western Asia and is widely cultivated as a vegetable crop. The cost of an asparagus depends on where it’s purchased, time of year, if it’s fresh, the type and geographical location. On average, plan on spending anywhere from $1 to as much as $4 per pound of fresh asparagus depending on the season. Fresh asparagus, when in season, can cost around $2 a pound. Organic asparagus at a local farmers market will be on the higher end, sometimes costing as much as $3 to $5 per pound. At Walmart, the costs of a bunch retailed for $2.97 in the month of August. Sam’s Club offers asparagus in two-pound bundles that retail for close to $9 or $4.50 per pound. According to this USDA report, the average cost of fresh asparagus per cup was $2.58 in 2013. Frozen and canned asparagus, on the other hand, costs around $2 to $5 per 14-ounce can or eight-ounce bag. Asparagus is often sold in a bunch. Typically, you will get anywhere from 15 to 30 stems in a bunch wrapped with a rubber band and label at your local grocery store. Asparagus grows around three to five feet tall, with stout stems and feathery foliage. The leaves are needle-like stems which grow around six to 32 millimeters long and one millimeter wide. The flowers are bell-shaped with shades of greenish-white to yellow and are around four to seven millimeters long. The fruit is a small red berry that is poisonous to humans. Asparagus is made up of 93 percent water and is a good source of vitamin B6, calcium, magnesium, zinc, dietary fiber, protein, vitamins A, C, E, and K, as well as thiamin, riboflavin, niacin, folic acid, iron, phosphorus, potassium and manganese, among others. It is also rich in amino acids. According to Aldi, you won’t find any fat, cholesterol, sodium or saturated fat. There are different varieties of asparagus, including cultivated, green, white, purple and wild. Each of these varieties will be about the same price, with the exception of wild asparagus, which will be priced higher due to the rarity. 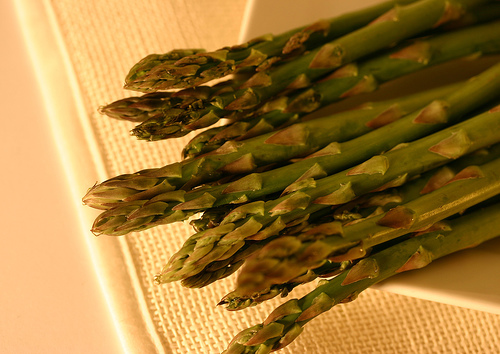 To prepare asparagus, rinse the spears and break off the rough ends before cooking. There are quite a few ways that you can cook your asparagus, including steaming, baking, boiling, stir-frying, roasting, and grilling. For different tips and recipes, check out this About.com article. Fresh asparagus will store for about one week when stored in a refrigerator. When storing, trim the stalk ends and stand the asparagus up in a mug filled with two inches of water. Loosely cover these tops with a plastic wrap to maximize its freshness. When picking a bunch at the store, choose one with an odorless stalk and tight tips. Avoid wilted or poor looking stalks. It will take an asparagus plant three years after it’s planted to produce the edible spears. Generally, it will continue to produce these spears for up to 15 years. How much asparagus per person? One pound will generate up to 15 spears, typically up to 10 inches long and a half inch thick. Using this formula, plan on serving two to four people with one pound of asparagus. Do not forget to look for sales at your local grocery store. If on sale, don’t be afraid to stock up since you can freeze it for future use. Local farmer’s markets can often be cheaper and fresher than your local grocery store.